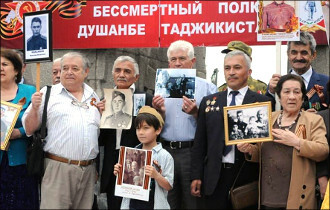 Currently, 447 World War II veterans live in Tajikistan, the ‘Khovar’ national news agency reports. Each of them was allocated with 3,000 Tajik somoni ($353) as a gift for the Victory Day celebrated on 9 May. 2,776 WWII veterans live in Kazakhstan, 594 veterans in Kyrgyzstan, where they receive a monthly lifelong allowance from the President of Kyrgyzstan in the amount of 10,000 Kyrgyz soms ($148). In Uzbekistan, there are 1,615 WWII veterans at present. As for Turkmenistan, it is not possible to find an openly available data on the number of WWII veterans living there today. It is only known that each of them will receive 200 Turkmen manats ($57 according to the official exchange rate or $28 according to the ‘black market’ rate) as a one-time reward.